Online dating is, how do we put this, a very hit-or-miss experience. We all know someone who deletes their dating apps every month in frustration, but then we all know the loved-up couple who swear it was “love at first swipe.” If you’re of the latter persuasion, you could get free stuff just for being in a relationship. The only catch is: you and your partner must have met on Hinge. 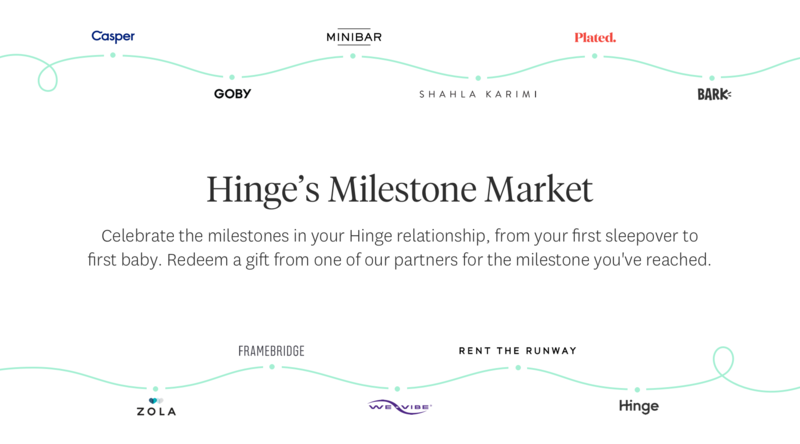 Hinge’s Milestone Marketplace is giving away free stuff. There are freebies for every major moment in a relationship. Casper pillows for the couple celebrating their first sleepover, a Plated subscription for moving in together, a Goby electric toothbrush for being exclusive, a Rent the Runway dress for getting through the first year of marriage. 2. Tag @Hinge and the corresponding partner in an Instagram picture and share your Hinge success story. 3. Hinge will verify that you met on their app, and the corresponding partner will send over the gift. Also, one couple with the best story will win a free Casper mattress! Yes, a Casper mattress like all the celebrities have! What are you waiting for? Grab your Hinge-approved mate and get your free stuff here!